JUNEAU, AK (September 4, 2013) Bishop Edward J. Burns, in response to the call by Pope Francis for a worldwide day of fasting and prayer for peace in Syria, the Middle East and throughout the world, has called on Catholics in the Diocese of Juneau and Southeast Alaska to make Saturday, September 7th a day of prayer and fasting. 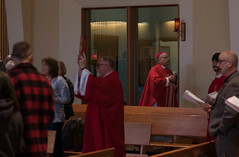 Bishop Burns asks that parishes throughout the Diocese set aside time on Saturday, September 7th for public prayer between 10:00am-3:00pm (Alaska time) to coincide with the prayer vigil planned at the Vatican from 7:00pm until midnight (Rome time). Bishop Burns will be leading prayers for peace in Syria at St. Catherine of Siena Catholic Church in Petersburg, Alaska, where he will be making his pastoral visit for the Year of Faith. He cordially invites all Christians, those who belong to other faith communities and men and women of good will to join the Catholic community in praying and fasting for peace in Syria and the Middle East on Saturday. Pope Francis, in making this announcement this last Sunday in Rome said: ”I appeal strongly for peace, an appeal which arises from deep within me. How much suffering, how much devastation, how much pain has the use of arms carried in its wake in that martyred country, especially among civilians and the unarmed! I think of how many children will not see the light of the future! With utmost firmness I condemn the use of chemical weapons: I tell you that those terrible images from recent days are burned into my mind and heart. There is a judgment of God and of history upon our actions which are inescapable! Never has the use of violence brought peace in its wake. War begets war, violence begets violence. 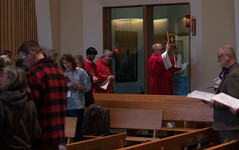 The Cathedral of the Nativity of the Blessed Virgin Mary in Juneau will hold their regularly scheduled Saturday morning mass at 9:30 a.m. on Sept. 7th, followed by Eucharistic Adoration until 12 noon. The Cathedral is located on the corner of 5th and Gold Streets in downtown Juneau. St. Paul the Apostle Parish in Juneau will begin a 28-hour period of Adoration beginning after the noon mass on Friday, Sept. 6th and extending through until the Saturday 5:30 p.m. mass on Sept. 7th. Adoration will be held in the day chapel—the Shrine to Our Lady of the Rosary—at 9055 Atlin Drive. For more information about the Day of Prayer and Fasting for Peace in Syria and the Middle East, go to: Diocesan website (www.dioceseofjuneau.org) or contact the Diocese of Juneau Office of Communications at 586-2227 ext. 32.